In this year’s National Dining Trends survey, Zagat asked nearly 13,000 avid diners across the nation about spending habits, social media influence on food choices, and dining do’s and don’ts. Nationally, diners spend an average of $36.40 per person at a restaurant. New York City and Boston spend above the national average, with $46.14 in NYC and $41.54 in Boston. Philadelphians are the highest tippers with an average 20.3% tip, up from 19.9% in 2015. Diners in Denver and Washington D.C. also show their server extra appreciation by tipping 19.5% and 19.2%, respectively, surpassing the national average tip of 18.1%. As restaurateurs experiment with eliminating tips in favor of higher menu prices, 43% nationally say they support it and hope it catches on, while 33% “hate it”. Diners in New Orleans are opposed to it the most (42%), followed by those in Miami and Charleston (40%). For most of those surveyed, the days of dialing a restaurant to make a reservation are over. 57% report making restaurant reservations via internet and 25% make reservations with the touch of a finger on mobile dining apps. Diners in Washington D.C. seem to avoid calling at all costs as 77% say they make reservations online. There’s no shame in browsing social media and double tapping restaurant and food pictures. Among diners who browse food photos on social media (53%), 75% say they have actually picked a place to eat based on shared food photos. Dining out is not without its irritations. Nationally, diners reported noise is the most bothersome at 24%, followed by service (23%), crowds (15%), high prices (12%), and parking (10%). Restaurant furniture and style may also be annoying to diners. 70% of those surveyed say they are “over” backless chairs and stools. 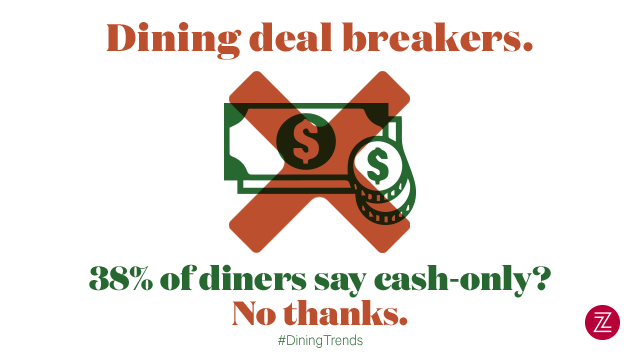 As far as dining deal breakers, the survey revealed 36% of diners are turned off by a cash-only policy. Other deal breakers include sitting at communal tables (33%), an inflexible no-substitution policy (27%), and a strict reservation-only policy (19%). Vacation is the perfect time to indulge in local cuisine. 56% of diners surveyed say they have or would eat multiple lunches or dinners during a trip to squeeze in all of the locale’s must-try dishes. Overwhelmingly, 70% of Honolulu residents have done this or would do it, followed by foodies in NOLA (65%) and Austin (64%). Some would even go the distance to travel for a good meal. 54% of diners said they would travel up to 30 minutes, 20% said a few hours, 13% would make a weekend drive, and 13% would go the farthest and jump on a plane or plan a vacation around a “must try” dish. Diners in Orlando are the most willing (31%) to travel a few hours, followed by Chicago and Nashville at 25%. For some, a full phone battery is essential for keeping up-to-date on all food news. 56% of New York patrons have or would ask to charge their phone in a bar or restaurant, compared to the national average of 45%. Diners in Detroit and Seattle are less concerned with bothering staff about their phone batteries as 64% say they would not ask to charge their phones in a restaurant or bar. Most diners aren’t willing to shell out some dough to get into a popular restaurant. 72% said they would not pay for a hard-to-get reservation, while there are some willing to do whatever it takes for the hottest seat in town. 20% of those surveyed said they would pay for a hard-to-get reservation and 8% said they have done it. According to surveyors, honesty is typically the best policy. 81% of diners said they would never lie about it being a special occasion for a restaurant freebie, while a cool 10% have told a little white lie. Honolulu is the most daring as 28% of diners claimed they have or would lie about a special occasion to get something for free. For more information on this year's dining trends, and to find the best places to eat near you, visit Zagat.com. The unofficial start of summer is upon us and Zagat is releasing the results of its latest Barbecue Survey. Among the 3,559 diners nationwide who participated, 42% say they would be willing to drive several hours for great barbecue and 19% are willing to get on a plane and fly to a favorite spot. Summer travel abound! With this in mind, now through July 4th, Zagat is hitting the road with HuffPost and livestreaming daily to from the best BBQ joints around the country. Get behind-the-scenes access to the country’s top pitmasters, sauce makers and smoke experts by following #ZagatBBQNation on Instagram, Facebook, and Twitter. Many states and regions claim their barbecue style is the best, but according to diners, Texas-style is tops (32%), followed by Kansas City (16%) and Memphis (14%). As for favorite barbecue meats, ribs are the favorite (34%), followed by brisket (28%), pulled pork (21%), burnt ends (9%), chicken (3%), and sausage (1%). When it comes to sides, cole slaw is the go-to with 46% of diners saying it is their favorite traditional barbeque side dish. Respondents ranked baked beans (42%), cornbread (26%), potato salad (24%) and mac n cheese (23%) as their favorite. Hungry for great BBQ near you? Check out Zagat’s ultimate guide to regional BBQ. Join the fun by Instagramming your favorite barbecue dish or eatery with #ZagatBBQNation. At the end of the tour, we'll announce a People's Choice winner! It’s time to celebrate that one special lady – Mom! Zagat polled nearly 1,000 people nationwide, 71% of whom are mothers, to see how families are planning to celebrate Mother’s Day. First rule of thumb, don’t be cliché and leave a trail of crumbs; only 4% of moms report wanting breakfast in bed this year. More than half of them (53%) say they want to go out to eat with family on Mother’s Day, with brunch as the preferred meal according to 39% of moms. 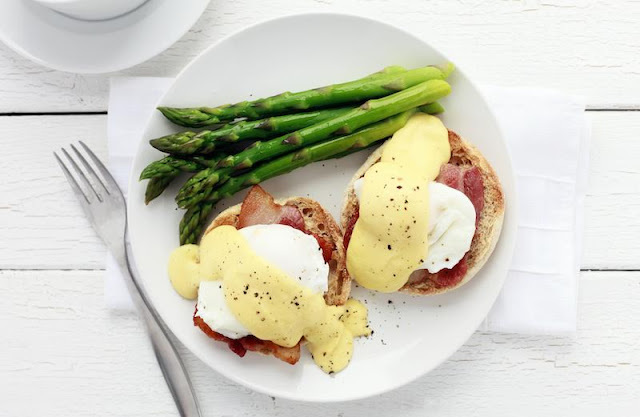 And while you’re there, stick to the classics – 43% of moms favor Eggs Benedict, 35% favor omelettes, and 19% say they want the ubiquitous avocado toast. When it comes to the most annoying brunch trends, respondents cite loud, live music (31%), communal tables (25%) and no reservation restaurants (21%) as the top 3 irritants. Things that make mom happy? The top brunch cocktail is a Mimosa (23%) followed closely by a Bloody Mary (22%). However, its best to save bottomless brunch drinks for your friends because 65% of moms only have 1-2 celebratory cocktails. Looking for the best places to take mom this Mother’s Day? Check out Zagat's round up of Best New Brunches or download the Zagat iOS app today. Our improved search functionality provides dining suggestions based on the time of day, plus an interactive map to help you find the perfect place nearby. In addition to Zagat’s iconic ratings and reviews, our restaurant profile pages boast larger photos, insider tips, and Google user reviews and ratings to help you make the best decisions. Before you plan your next dining out adventure, be sure to give the new Zagat.com a try! For over 30 years, Zagat’s mission has been to help diners find the best places to eat and drink. Our editors carefully craft reliable reviews and lists based on diner feedback. Today we’re introducing a beautiful new Zagat.com featuring stunning photos, a richer map experience and new tools for discovery. Our redesigned site makes it easier to find what you’re looking for, whether it’s scoring insider tips on the hottest new restaurants or deciding which Insta-worthy desserts you should be standing in line for. Think romantic ambiance is most important for your Valentine? Forget it. 51% of diners say they are most interested in how good the food is. So what’s on the menu? The most popular cuisine this year is Italian (17%) followed by French (13%), Seafood (13%), Steak (11%), American (10%), Sushi (7%), Mexican (3%) and Chinese (1%). One fifth (20%) of Valentine’s Day diners say they don’t care about the cuisine. Unsurprisingly, more men prefer a steak dinner than women (16% vs. 8%). Aside from dining out, the most popular ways to celebrate love include exchanging gifts like chocolate or jewelry (27%), cooking a meal at home (16%) or ordering in (10%). Not every Valentine’s Day has a perfect rom-com ending though. A minority 5% of surveyors admit they have dumped someone/been dumped on Valentine’s Day, or broken up with someone because Valentine’s Day was coming….Ouch! Whether you're happily in love or waiting for cupid’s arrow to strike, February 14th is fast approaching. Zagat polled nearly 800 people nationwide to find out about their Valentine's Day plans and preferences, and how they will (53%) or won't (47%) be spending the holiday. Of those celebrating, 40% say “it is a time to celebrate love!” while 8% say they’re only doing so because their partner would make them feel guilty otherwise. Among those who choose not to celebrate, 33% say it’s because Valentine’s Day is a made up holiday while 14% are boycotting because they are single. If you haven't made a Valentine’s Day restaurant reservation yet, you can bet the hottest seats in town are taken, as the majority of surveyors (53%) say they’re going out to dinner. 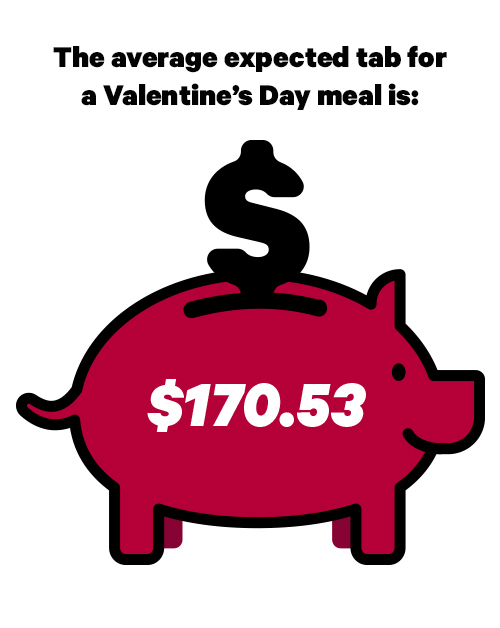 This year, diners report spending more than ever on a Valentine’s Day meal. The average expected tab is $170.53 which is up 16% from $146.52 in 2012. Looking for the best places to eat in NYC? The scores have been tallied, and today, Zagat is unveiling its 2017 New York City Restaurants results, covering 2,171 eateries - from food halls to fine dining, tacos to trattorias - and everything in between. The results are based on the feedback of 30,961 local diners and curated by Zagat’s expert editors. Results are available today in the new Zagat iPhone App, on Zagat.com and in the 2017 Zagat NYC guide. Known for its succinct reviews, Zagat proves that small things are easier to digest. 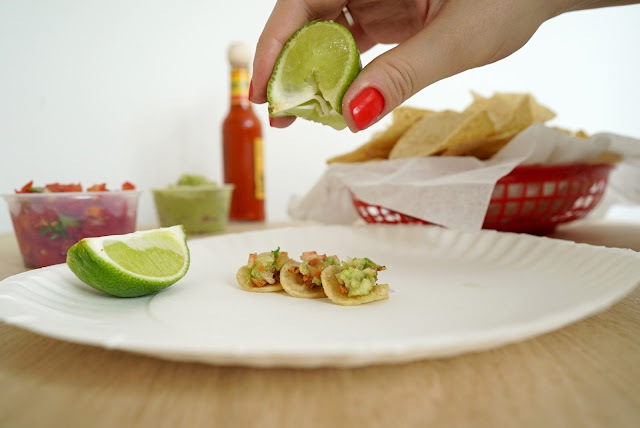 To highlight this Zagat is opening a Tiny Cafe at Astor Place serving up free tiny dishes inspired by some of the city’s best restaurants from Thursday, 10/27 to Saturday, 10/29. This year, New Yorkers report eating 4.9 lunches and dinners per week and spending an average of $50.11 per person for dinner. In comparison, in 2014, the average meals out per week was 4.7 and the average cost was $48.15. This year’s top rated newcomer is French-American restaurant Kingsley in the East Village which reviewers say is the “best-kept secret - but not for long”. Following behind are Indian Accent, Lilia, Quality Eats, Llama Inn, High Street on Hudson, Le Coq Rico and Cafe Altro Paradiso. Notable restaurants that are too new to have ratings but have had great word of mouth include Agern, Emmy Squared, Karasu, Le Coucou, Olmsted and Paowalla. Eric Ripert’s “world class”, “transcendent” French Seafooder Le Bernardin wins Top Food for the 8th year in a row - an unprecedented achievement in the 38 year history of Zagat. Le Bernardin also swept Top Service, Most Popular, Top French and Top Seafood. Only one major category, Top Decor, was won by another restaurant, Asiate, in the Mandarin Oriental Hotel. Other contenders for the Top Food ratings are Bouley, Jean-Georges, Daniel, Gotham Bar and Grill, Peter Luger, Tocqueville and Gramercy Tavern. Relative newcomer, Gabriel Kreuther broke onto the Top Food list coming in at No. 7. A number of first-time category winners are shaking things up: these include Eataly (Food Halls), Indian Accent (Indian), Juliana’s (Pizza), Kingsley (American), Los Tacos No. 1 (Mexican), Mu Ramen (Ramen) and Two Little Red Hens (Dessert). With the influx of new pizza-pasta-focused places opening, such as Pasquale Jones, Emmy Squared, Lilia and La Sirena, it’s safe to say that carbs are back! And 55% of New Yorkers say they love this trend. To keep up with this demand, Zagat has added new lists this year for Donuts (winner: Peter Pan Donut) and Bagels (winner: Absolute Bagels). With election season in full swing, Zagat asked diners which past, current or future president they would trust for a restaurant recommendation. The winner: Barack Obama. If diners were owed a favor from the president in the form of a prized NYC dinner reservation at a hot new place, the top picks were Momofuku Nishi, Le Coucou and La Sirena. When queried about their plans for the election night, (54%) said they would be watching tv at home over takeout. Food halls, which were almost non-existent 10 years ago, have been expanding with more on the horizon. This year, newcomers include The Great Northern Food Hall, The Pennsy, TurnStyle, and Union Fare, while Jean-Georges’ seafood-themed food hall and the Bourdain Market at Pier 57 on the Hudson are on tap. Among Zagat reviewers, a record 41% say they approve of eliminating tipping. Newcomers such as Agern, Faun, Freek’s Mill, Pasquale Jones and b joined a growing number of established restaurants like Dirt Candy, Huertas, Eleven Madison Park and Danny Meyer restaurants (The Modern, b) in adopting the tip free practice, but raising prices to compensate. 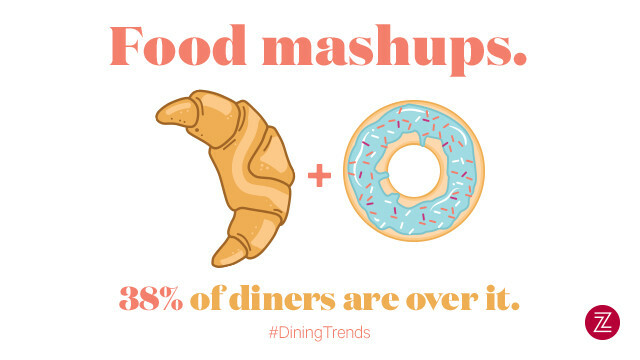 Restaurant trends like farm-to-table dining resonate with diners with 70% of New Yorkers claiming they love it, while roughly 65% of respondents now dismiss gimmicky dishes such as the gold donut and rainbow bagel, and 58% say kale salad is a dish they are tired of seeing on menus. While Zagat’s trusted guidance remains the same, we have updated the Zagat look and feel. See for yourself by downloading the Zagat iPhone app or getting the 2017 Zagat NYC guidebook to start planning your next great meal. Not only are food-obsessed American diners scrolling through their feeds to check out the latest food shots, but they have no qualms about snapping their own photos while at restaurants. Almost half of diners nationally (44%) say that they take food photos when dining out to share on social media, with the most likely food photographers hailing from Charleston, San Diego (both 53%), Austin, Miami and Orlando (all 51%). In fact, 19% say they have picked a place to eat just so they can take their own food photos. Once they’re at the restaurant, diners are so focused on getting the perfect shot that 60% admit to stopping dining companions from eating so they can take food photos. 50% say they have taken photos of every dish at the table and 5% have even asked another table if they can photograph their dish. It doesn’t come without consequence though as 8% of those who take food photos to share on social media say they have even dropped their phone on their meal trying to get the perfect shot. Check, please! When it’s time to post those hard-earned pictures to social media, 41% of diners say they do so right at the table, 34% say they post later that night/from the comfort of their bed, 14% say they do it on the way home, 10% save them for #tbt or later, and 1% admit slipping into the restroom during the meal. Foodie photographers in Detroit and San Antonio (both 58%) are most likely to post photos at the table. Which foods have been showing up the most in your social media feed? Trendy foods on the rise this year include avocado toast, according to 33% of respondents who say they “love it,” which is up from 24% last year. 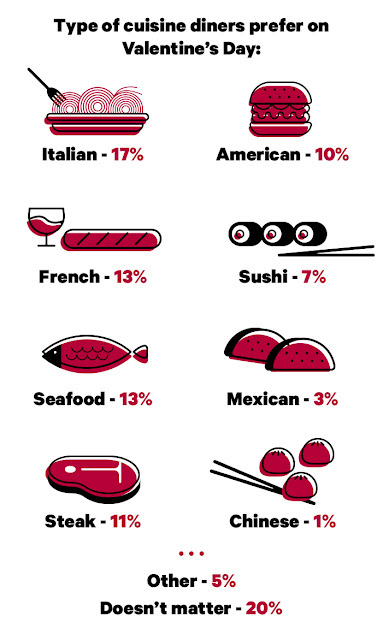 Other trendy foods feeling the love are ramen (31%, up from 26% last year), Sriracha, and pork belly (both 31%). 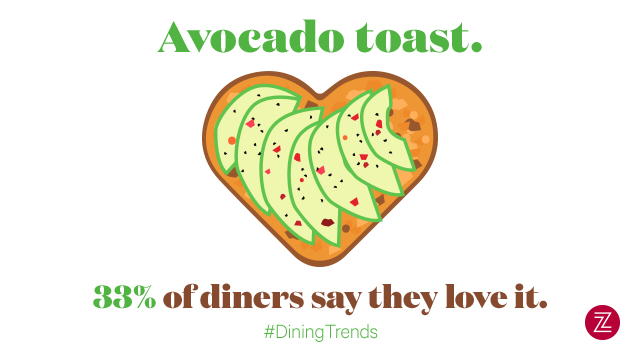 Honolulu diners are the biggest fans of ramen (53% say they “love it”) while Angelenos are having a moment with avocado toast (41%). Orlando diners are hip to quinoa (34% “love it” vs. 28% nationally) and a quarter of New York respondents say they “love” cauliflower rice. Other trendy foods are so yesterday. Food mashups (i.e. cronut, ramen burger) are on their way out according to the 38% of diners nationally who say they are “over it.” Those most fed up with the trend are respondents in Seattle (50%). The top pet peeve (or dining deal-breaker) that would stop people from dining at a particular restaurant is a cash-only policy (38%), followed closely by communal tables, no-substitution policy (both 33%), reservation-only policy (20%), no-reservation policy (19%), no photos allowed (13%) and none of the above (25%). Diners in Charlotte are the most annoyed by a cash-only policy (50%) and Houston diners detest no-substitutions (48%). Knowing where your food comes from is still hugely important according to 73% of diners nationally who say Farm-to-table-dining is a much-loved restaurant practice. Those in Portland, OR are amongst the highest proponents in the nation (79%) and those in Charlotte are at the lower end of the spectrum (68%). When it comes to trends in mixology, respondents are loving fresh juices in cocktails (63%), but the jury is split on fancy ice in cocktails; 25% say they “love it” and 25% say they are “over it.” The other half don’t mind it or have no opinion. Additional findings: When asked if they would ever pay their restaurant bill with a mobile payment app, 66% of diners say “Yes, I’ve done it, or I would” while 34% say “No,” compared to 59% and 41% last year respectively. When it comes to asking to charge their phone in a bar or restaurant, 41% of diners nationally say “Yes, I’ve done it, or I would.” New Yorkers are the most likely to do this (56%) and those in Honolulu are the least (29%). Almost 1 in 5 respondents (17%) admit they have or would lie about it being a special occasion in order to get a freebie while 14% have or would fake a food allergy to get a dish modified to their liking. If it feels like everyone today is a foodie, well it should. 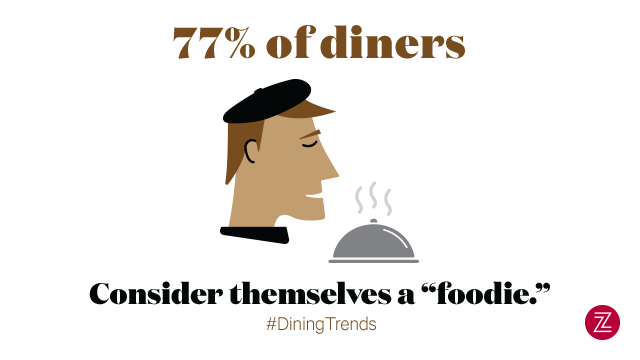 According to the survey, 77% of respondents consider themselves to be foodies -- 41% say they are secretly foodies, but hate the term while the other 36% say “yes, with my fork on my sleeve!” For more information on the latest National Dining Trends survey, check out Zagat Buzz. We all know social media has become an important part of the food world, and Zagat’s latest National Dining Trends survey shows just how influential it can be. According to the survey, 60% of avid diners across the U.S. say they browse food photos on social media, and among them, 75% say they have picked a place to eat based on these photos alone. From trendy foods to dining deal-breakers, the survey uncovers the habits and preferences of nearly 10,000 avid restaurant goers across the nation, highlighting 26 U.S. cities.